I was writing an email to a friend this morning, when it dawned on me yet again just how happy I am. It’s certainly not circumstantial – life has been clipping along at a normal pace with nothing too out of the ordinary to make note of. I prepare for auditions, go to classes, get excited for callbacks, even book the occasional job. I enjoy brunches with friends, dates with my man, and afternoon coffees for myself. I navigate the ups and downs – the busy times and the lulls – and power my way through the countless rejections that come with the territory of being an actor. Like any career, the one I’ve chosen isn’t all rainbows and sunshine. And like any life, the one I’ve been blessed with isn’t devoid of hard times and heartache. There is one difference though, and that is this: I wake up every day and choose to be happy. There’s a film I saw once called “About Time”. To be honest, I thought it was going to be the typical lame, sappy, make-me-cry-while-making-me-feel-stupid-for-crying Rachel McAdams romcom, but I was pleasantly surprised by a film with heart about real love – for family, new and old, and for life. I don’t want to give away the ending (since I’m assuming my recommendation will make all of you go out and see it.. ahem, ahem…) but the essential thing the main character learns by the end of the film is to choose to be happy and you will be. So I do. 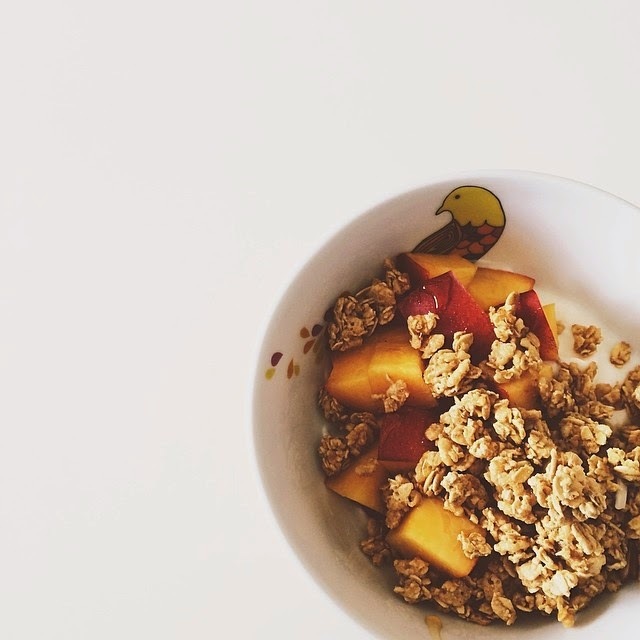 I take a second to enjoy a breakfast of fruit, granola, and yogurt – perfect in it’s simplicity. I allow the adorable little monster I sometimes nanny to infect me with her boundless energy and endless amusement. I catch up with friends and laugh freely while realizing how rare and precious it is to have found friends such as these. I hold my grandma’s hand, hug my grandpa tight, and learn to slow life down to their pace for just a few hours because I know that soon I may not get the chance and this is time I will never get back. I read a text/email/socialmediapost from my guy – modern day love letters and my daily afternoon pick-me-up. I drive with the windows rolled all the way down and weave my fingers through the california air. I bury my face in a pile of clean clothes fresh out of the dryer and take a slow, deep breath (is there anything better than the smell of clean laundry?) And through it all, I hold fast to the foundational truth that I have a God who is for me, will never leave me or forsake me, and loves me beyond all human comprehension. How could I possibly not find joy in such beautiful little things such as these? I love fruit, granola, and yogurt, too!!! Much love and joy shared as I read this post and others – little bee in the big city inspires me and reminds me it’s good to let the ones we fly into flourishing. Much love! Hi Victoria, what religion are you?